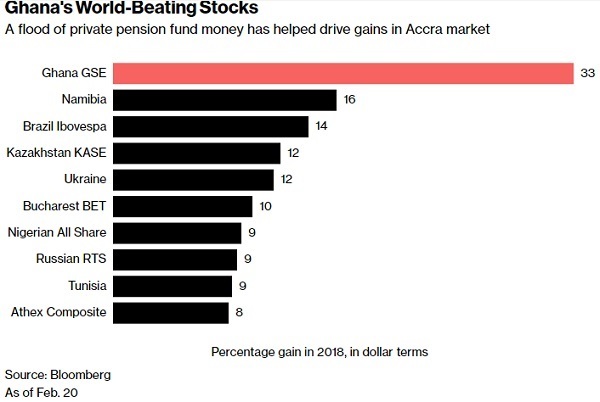 London, Feb. 23, 2018 (AltAfrika)-A flood of money from private pension funds has driven a 33 percent surge in Ghana’s benchmark stock index this year, giving the West African country the world’s best-performing equities. The government in December transferred 3.1 billion cedis ($690 million) to the funds, money the state had held since 2012 while the industry put structures in place for new entrants. Seven months earlier, Ghana doubled the proportion of assets that pension funds can invest in stocks to 20 percent.